Crystallography is an ancient subject and began as soon as man looked at gemstones, minerals and beautifully formed crystals that could be obtained from substances as common as sea water and molasses. Crystals are obtained in all sizes and shapes. Louis Pasteur found, more than 150 years ago, that they could be obtained in right- and left-handed non-superimposable shapes leading to a fascinating branch of chemistry called stereochemistry, or the chemistry of spaces. A century ago, it was found by Max von Laue in Germany that crystals diffract - in other words, they bend X-rays - and this discovery was harnessed by W. H. Bragg and W. L. Bragg in the UK to obtain the internal structure of solids in terms of where atoms, ions and molecules are situated with respect to one another. These remarkable discoveries paved the way for a revolution in structural science. Today, a hundred years later there is literally no branch of physics, chemistry, biology, medicine, mineralogy and structural and materials sciences that are untouched by crystallography. The benefits to mankind have been enormous and range from the discovery of medicines and drugs, to materials that make the quality of life better for all. It is worthwhile to record here that more than 25 Nobel Prizes have been awarded in the last 100 years for discoveries in physics, chemistry, biology and medicine that depend more or less directly on crystallography. The United Nations have declared 2014 as the International Year of Crystallography and have charged the International Union of Crystallography to work with UNESCO in celebrating the Year and popularizing this very important subject. While crystallography is a high-level scientific activity, its applications are easy to enjoy and appreciate by all. The IUCr and UNESCO have undertaken a wide-ranging program of activities from crystal growing experiments for school children to highly specialized scientific meetings and summits for researchers. An ambitious program of open laboratories in at least 20 countries worldwide, many in less endowed regions of Africa, South and Central America and South Asia has been launched and in these labs there will be an opportunity for students and young researchers to obtain hands-on training with sophisticated equipment that measure the diffraction of X-rays by crystals. The future of crystallography, indeed, lies in these parts of the world that have the people power and an increasingly growing economic muscle. The IUCr is committed to the spreading of the subject of crystallography in all parts of the world because it is only through an increasing belief in the value of science that all-round progress can be obtained that benefits society at large. Gautam R. Desiraju (Indian Institute of Science, Bangalore, India) is a structural chemist who has played a major role in the development and growth of crystal engineering. Professor Desiraju has authored around 375 publications and been recognized by awards such as the Alexander von Humboldt Forschungspreis and the TWAS (Third World Academy of Sciences) Prize in Chemistry. 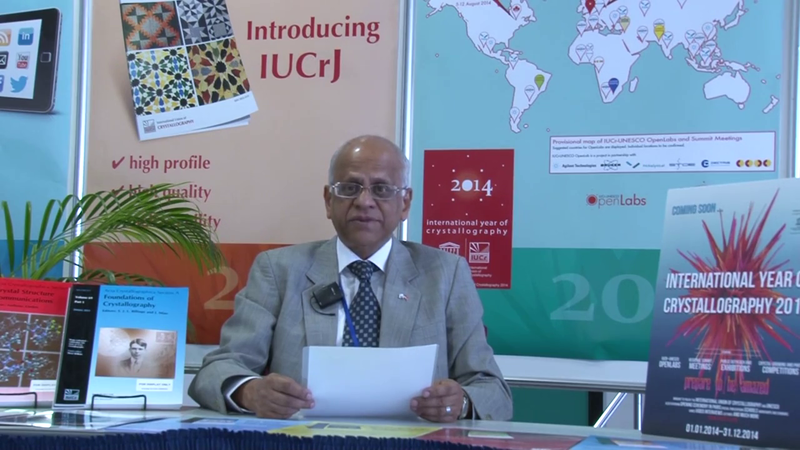 He was elected President of the International Union of Crystallography (IUCr) for the triennium 2011–2014, and is one of the Main Editors of IUCrJ, the IUCr’s new open-access journal.